Montreal-born Shelley Katz holds both Bachelor and Master degrees from the prestigious Julliard School in New York. He has played under the batons of Bernstein, Osawa, Solti and Dutoit. In Germany, in Dusseldorf, Koblenz and Mainz, he worked for eight years as Repetitor, Studien-leiter and Conductor. 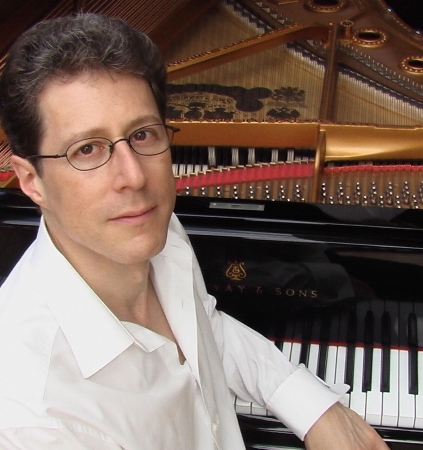 As a piano soloist and chamber musician, S. Katz has appeared in concerts around the world in leading venues, including Carnegie Hall, Musikverein (Vienna), Wigmore Hall (London), the Kremlin (Moscow) and Santory Hall (Tokyo). He has accompanied Nicolai Gedda, Jochen Kowalski, Dame Gwyneth Jones and Katia Ricciarelli among others. He broadcasts in Europe, North America and Japan. His CD recordings include: Bach's Goldberg Variations, Canadian piano solos, Schumann's Dichterliebe (Kowalski) and Stolz's Blumenlieder (Schellenberger). In addition to performing, Katz holds a Ph.D. in Music Technology; he has been granted patents on digital instruments and speaker technology. Dr. Katz is currently the Director of the Symphonova Project and the S Lab, a research institute at the University of Surrey in Guildford, UK. He is also a Visiting Fellow of Wolfson College, Cambridge University, and Musician-in-Residence at the BISC Queens University (Canada). Approximately 10 years ago, the serendipitous result of an intensive study into digital pianos led Dr. Katz to the concept of layered sound; he converted the concept into the technology that ultimately opened the latest chapter in the field of loudspeaker design, and to the propagated air-disturbance patterns, which have a direct effect on the perceived acoustics. During the years of scientific analyses and experimentation, Dr. Katz discovered a method that permitted him to obtain a patent on the LS Technology from PCT in April of 2007. At the end of a century which had witnessed so many failed attempts to improve conventional sound systems, Dr. Katz moved the acoustics and sound production industry forward; he obtained superior sound reproduction, and he established new guidelines. Natural sound manifests two types of sound-waves: binaurally correlated and binaurally de-correlated waves. Binaurally correlated sound waves are highly cohesive, and among other things, permit us to determine where a sound source is located.Binaurally de-correlated sound waves are highly incoherent, and among other things, permit us to estimate our distance from the source, or the nature and size of an acoustic space. The main problem with loudspeakers is their inability to propagate sound with both wave-types. This is an engineered limitation inherent in the mechanical nature of the devices themselves. Conventional cone loudspeakers propagate longitudinal waves. Longitudinal waves are highlycohesive and binaurally correlated. Resonating DML type loudspeakers are transverse wave loudspeakers. Transverse sound waves are highly incoherent and binaurally decorrelated. It is simply impossible to propagate transverse waves with a conventional loudspeaker and conversely, it is impossible to propagate longitudinal waves with a resonating panel loudspeaker. No amount of DSP, loudspeaker placement, room treatment or other adjustments will change this simple fact. To reproduce natural sound, both types of loudspeakers are required. Layered Sound™ is a patented, innovative method of using two types of loudspeakers- conventional cone and Distributed Mode (flat-panel). Each type of speaker has a natural strength. Layered Sound fully exploits these strengths to produce a uniquely superior and natural sound. It also simultaneously masks the respective weaknesses of the two types of speakers. The correct balance between direct and reflected sound is very desirable. When we listen to acoustic instruments in a concert space, we hear a blend of direct and reflected sounds. This combination creates the impressive effect, we all enjoy and instinctively recognize as a natural sound. Unfortunately, conventional loudspeakers do not provide good reflected sound due to destructive interference and DM loudspeakers do not provide better direct sound due to their diffuse nature of transmitting sound. Not every loudspeaker is ideal for generating both direct and reflected sounds. However, conventional loudspeakers are well suited for direct sound and Distributed Mode loudspeakers are well suited for reflected sound. By combining these speaker designs according to the principles of Layered Sound, air disturbance patterns are created that physically emulate the sound waves of acoustic instruments, a natural sound. As a result, Layered Sound provides smooth diffusion, clarity and depth in any size room. Architectural applications of Layered Sound include music/film/drama theatres, conference halls and large or small rooms. Activities in these spaces include recorded sound that is amplified and reproduced, live sound that is reinforced, and a mix of recorded and live sound. The venues may be acoustically dry or reverberant, both presenting their own advantages and problems. Some of the common problems associated with large spaces are related to clarity, diffusion, and frequency response. Layered Sound is particularly effective at smoothing frequency response and creating a blanket of diffuse and evenly dispersed sound. It also maintains or improves the imaging and the localization of sounds. The result is a marked improvement in clarity, intelligibility and overall sound quality. This improvement is independent of whether the sound source is live, recorded or a mix of the two. by reducing man-hours and materials.